When you consign your posters and other collectibles to an auction, what are you looking for? Are you looking for fast cash, or are you looking to wait months and months before you even know what your items have sold for? Frequently, some auctions take what can feel like f-o-r-e-v-e-r to sell your wares, so that you can get your money and do with it what you were hoping to when you sent your posters off to them. Some auctions routinely take years to get through your complete consignment and that if you only send a few hundred items. MoviePosterBid.com is YOUR FASTEST WAY TO GET MONEY IN YOUR POCKET! When you consign to our July Auction, your items are sold in July and your payment for items sold (minus our low 25% consignment rate) within a few short weeks after that date (July sales are paid by the end of August). Some auctions you will be waiting 60 days further down the line or even longer! Especially if they do not sell your full consignment in a timely enough manner to suit YOUR NEEDS, NOT THE AUCTION'S NEEDS. NO OTHER AUCTION WILL SELL YOUR COLLECTIBLES AS FAST AS WE WILL AND WHEN YOU NEED MONEY FAST, WHO IS YOUR BEST CHOICE? ? Will those "other auctions" specifically promote your items in Print Advertising? 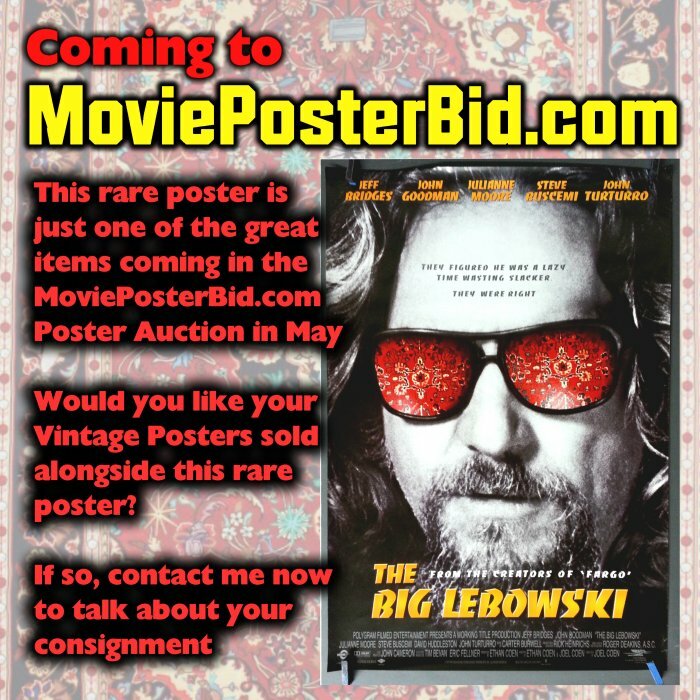 The answer is almost always "NO"
MoviePosterBid.com Auctions will promote your valued collectibles in print and online. Every Month we run an ad in Classic Images highlighting those items that deserve to be promoted. Every Month! But that's not all! We include flyers for our coming auctions in our packages when we do shipping. At MoviePosterBid.com, we take our job seriously and our job is to make you happy! Some auctions charge as much as 75% commission to sell your items. Some auctions charge a $14.00 buyer's premium (consignors get nothing from the BP, driving down realized value). MoviePosterBid.com charges a flat rate 25% for your entire consignment. We don't charge you more for selling your $14.00 items than we do for selling your $400.00 items and our rate goes down to 20% over $500. No auctioneer pays you more! In a world where 75% of the prices realized at some auction sites are $50.00 and under, the choice is clear. MoviePosterBid.com pays the highest and sells the fastest.... isn't that what you were looking for? ?